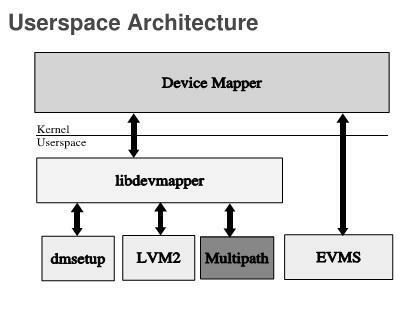 This is how the EVMS and LVM2 interact with the Device mapper . EVMS(Enterprise. Vol Mgmt System) and the LVM2( an extension to Logical Vol Mgmt System (LVM) for 2.4) are user interfaces to interact with the kernel on logical device mgmt. Path -> Logical Connection along a physical path to a prticular device. 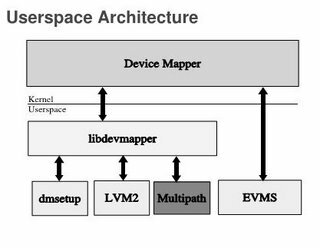 Also read - > multipathing user-space tools like multipath , dmsetup , dmraid , udev , hotplug.